The "zero" in Coke Zero will soon stand for how many Coke Zeros are available in the US. Coca-Cola has announced the end of Coke Zero. But from its ashes will rise another zero sugar Coke product that sounds pretty similar. It's called Coke Zero Sugar, and it'll be hitting stores in August. Though the name is basically identical, the drink will have a new recipe and packaging. The soda giant has been market testing the product for more than a year, looking for a way to continue attracting customers who avoid sugary drinks. It's said to have a taste closer to the original Coke while still containing zero calories and zero sugar. The drink is already available in 25 countries, including Mexico and the U.K.
"We’ve made the great taste of Coke Zero even better by optimizing the unique blend of flavors that gave Coke Zero its real Coca-Cola taste," the company said in a statement. 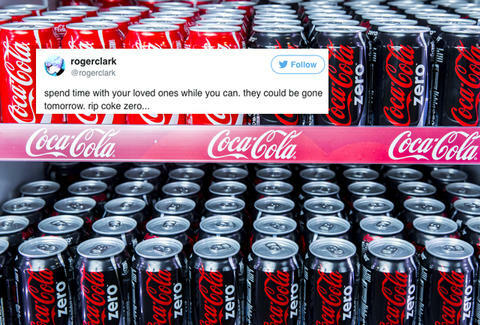 Despite the company's reassurances, Coke Zero enthusiasts are not pleased. Coke Zero, which has zero sugar, is being replaced by Coke Zero Sugar, which also has zero sugar. Can you hear the sound of my brain dying? Soda nostalgia is a strong force, though. Coke Zero may someday have a comeback tour the way Crystal Pepsi has.